WALL\THERAPY didn't host its annual summer street art festival in 2016 for various reasons. Founder Dr. Ian Wilson has been busy launching his own private practice, Rochester Endovascular, and in April the team sent five Rochester artists to work with Urban Nation in Berlin. But organizers say the festival will be back this summer, taking place July 21 through July 30, with a new feature: a one-day conference with lectures, talks, and performances. In the meantime, the group will kick off Women's History Month with a series of workshops led by internationally renowned artist Olek. A public art installation of her community-based project will go up in April. 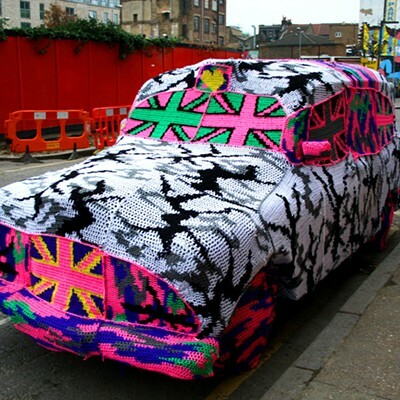 Olek is a vivacious, infectiously enthusiastic woman who has become known for her ambitious works in colorful crochet. The Poland-born, Brooklyn-based artist's chosen medium is rooted in traditional women's craft, and she uses her art to explore concepts of sexuality, feminist ideals, and the complex interconnectedness of our bodies and psychological processes. 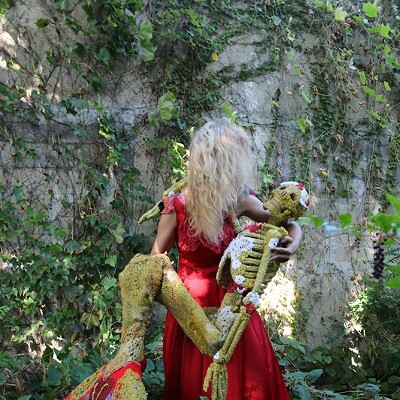 Olek, "Kiss Me I Crochet." Her current project has her traveling the US, working within different communities to install large-scale crocheted tributes to various historic women who have had a crucial impact on American history. She has chosen to kick off her latest endeavor in Rochester, because of our region's historic importance to the Suffrage movement. Throughout March, she'll work with the Rochester community to create a large-scale crochet work to be installed in the Susan B. Anthony neighborhood as a tribute to a prominent Rochesterian who was important to the fight for women's rights. While you can probably guess who her subject is, the details won't be disclosed until March 8 to coincide with International Women's Day. She's also in the process of organizing an installation to honor Harriet Tubman in Auburn, New York. The nation-wide project focuses on historic women whose work and achievements made it possible for a woman to run for president, Olek says. During the 2016 election season, she campaigned for Hillary Clinton, creating a crocheted portrait of the candidate with the text "#ImWithHer" that was installed on a billboard on Route 139 in New Jersey. "The goal is for community members of all ages, races, and genders to come together to each crochet 2-by-2-foot squares that Olek will bring together into the final piece, to be unveiled in early April," says Erich Lehman, WALL\THERAPY lead curator. To create the massive 26-foot by 54-foot piece, Olek will enlist the help of volunteers who have crochet skills. If you want to be involved but don't know how to crochet, sign up for one of the three free workshops she will lead on Sunday, March 5, through Tuesday, March 7 (see below for more information). During the workshops, Olek will speak about her experience as an immigrant from Poland and becoming an American citizen, and her work on women's rights projects. She'll also discuss the scope of her current project and will teach crochet skills to those inexperienced in the craft. 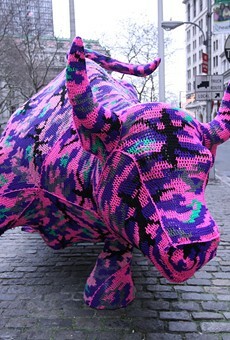 The origins of the Rochester connection to Olek's project are only a few weeks old. After a studio visit with DAZE, OG graffiti artist and WALL\THERAPY alum, he suggested that she get in touch with Wilson. 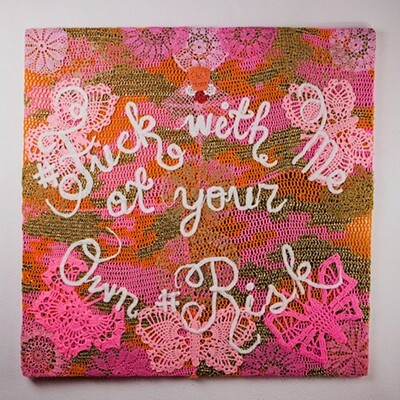 Olek was interested in bringing her project to Rochester "because it's steeped in the history of the suffrage movement and women's history," Wilson says. "It made sense to get behind it." Blending installation, fashion, and performance, Olek has transformed numerous public spaces. 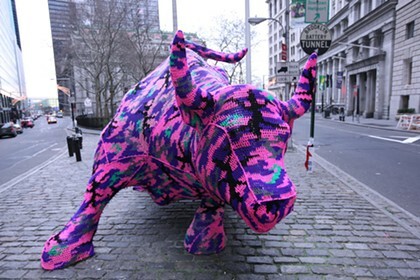 In past projects she wrapped the New York Stock Exchange bull; she gave a New York City bus a sweater that served as an advertisement for the TV show "Fargo"; and regularly outfits entire humans from head-to-toe in vibrantly patterned yarn suits. 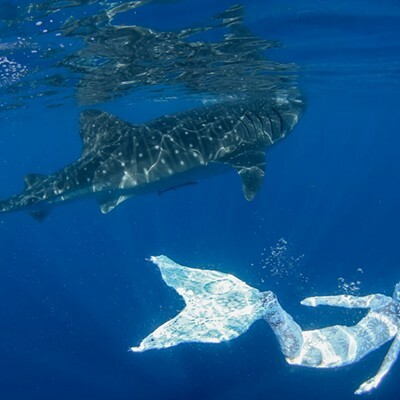 She also makes or embellishes her own dazzling clothing. 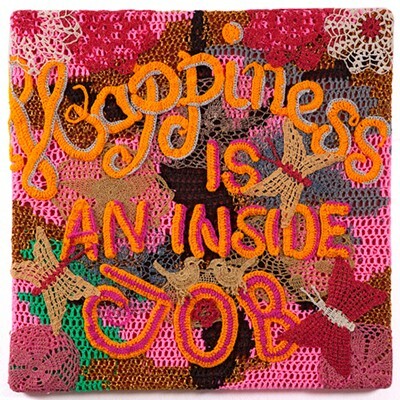 Olek is an ace at combining serious messages with levity -- her aesthetic injects an unsinkable tone into weighty topics. 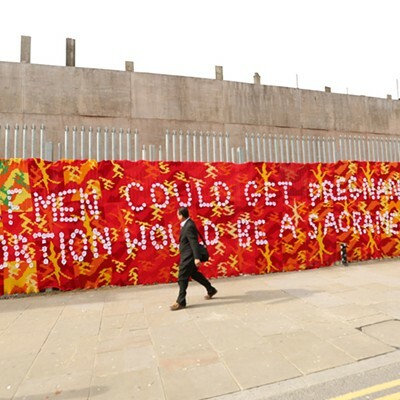 At times her work takes on a sculptural aspect; other projects incorporate text, like her 2014 crochet mural for International Women's Day at Stolen Space Gallery in London, which read: "If men could get pregnant abortion would be a sacrament." Sunday, March 5, 4 p.m. to 7 p.m. at Visual Studies Workshop, 31 Prince Street. Monday, March 6, 6:30 p.m. to 8:30 p.m. at Fiorella, 5 Public Market. Tuesday, March 7, 6:30 p.m. to 9:30 p.m. at 540WMain, 540 West Main Street. You can sign up for one of the workshops by emailing jacklyn@wall-therapy.com with your name and desired workshop date. The WALL\THERAPY team is also looking for donations of wood for the frame that will support Olek's work. And leading up to the summer festival, there will be lots of opportunities to help with financial support or logistical support including food, lodging, and supplies.